Arya had her six month visit to the pediatrician yesterday. 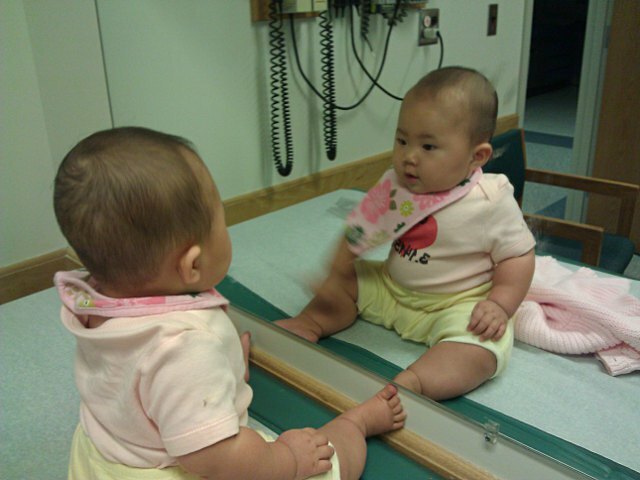 The six-month old visit is part of the normal well baby check-up schedule. In addition to her vaccinations, Mommy and I were anxious to hear what our pediatrician had to say about Arya’s head shape. During her four month visit to the pediatrician, Arya pooped at the doctor’s office right as she was supposed to be weighed. She had a dry and clean diaper this time so her weight gain might have been influenced by the fact she had yet to poop that day. At 19 pounds, 8 ounces, Arya gained two-and-a-half pounds since she was four-months old. Her weight still places her above the 90th percentile, but she is a few percentiles lower than in previous months. Although she can’t crawl yet, she is mobile and the fact she squirms around most of the day probably explain part of her relative weight decrease. Baby also grew an inch-and-a-half to make her height 26.5 inches. For her age, this places Arya in the 70th percentile for height. The best news was that Arya’s head circumference showed good growth since her last check-up. At 42.7cm, her head now falls squarely in the 50th percentile. Even better, our pediatrician thinks Arya’s head shape is fine and there is no need for any further examination for baby’s crooked head. Although the rest of the visit was good, my daughter didn’t enjoy getting her vaccinations. The six-month old baby visit calls for six different immunizations: Hepetitis B, Diphtheria/Tetanus/Pertussis, Haemophilus influenzae type b, Polio, Pneumococcal Conjugate, and Rotavirus. Five of the immunizations are given as shots to the thigh while the Rotavirus vaccine is given orally. Since Arya was getting so many shots anyway, we decided that the visit would be a good time to give her the first round of her seasonal flu shot. Arya was quite upset by the type all her shots were finished, but she calmed down quickly after I carried her. Our pediatrician gave us a cute book which baby promptly stuck in her mouth and Arya was happy by the time we left the doctor’s office. We are schedule for the second round of her seasonal flu shot in a few weeks. In the mean time we have to keep an eye on her for the next few days to make sure she doesn’t get any strange reaction to all her vaccinations.